You must travel to and enjoy this gem of a spot. It is a little known area that is waiting to be discovered by those who will appreciate its character. 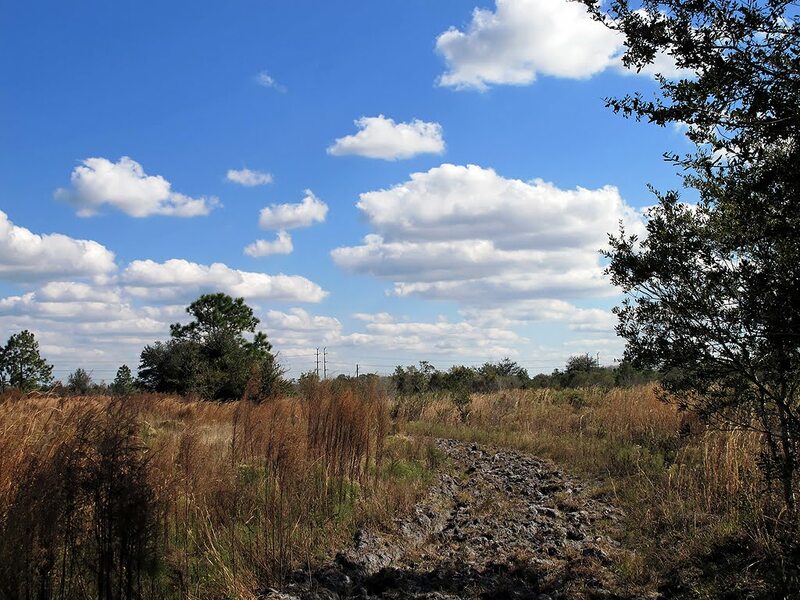 This area was purchased in order to preserve the native landscape and flora of this special spanse of Florida. It also was purchased to preserve a corridor along the Econlockhatchee River where wildlife could travel safely from north to south. It is part of the Orange County “Green Place” program. 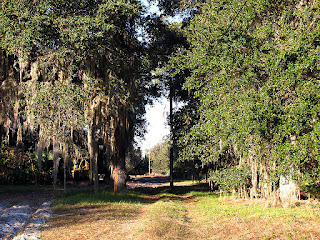 The land is managed by the St Johns River Water Management District. It is not that large of an area, so no need to fret about getting lost. 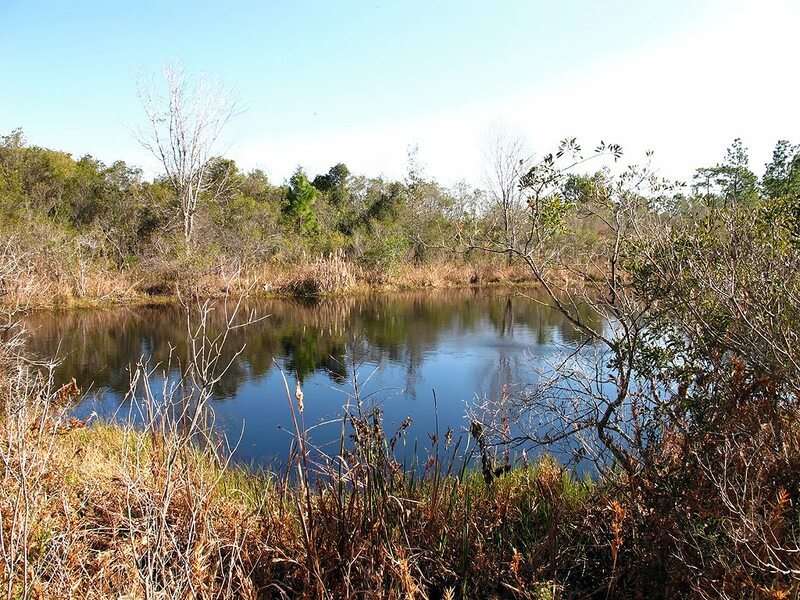 Though the size of the preserve renders it to be smaller than most, it does contain a number of eco-systems – from pine scrubs, oak hammocks, cypress domes, palmetto “ponds”, forested wetlands and pastures. 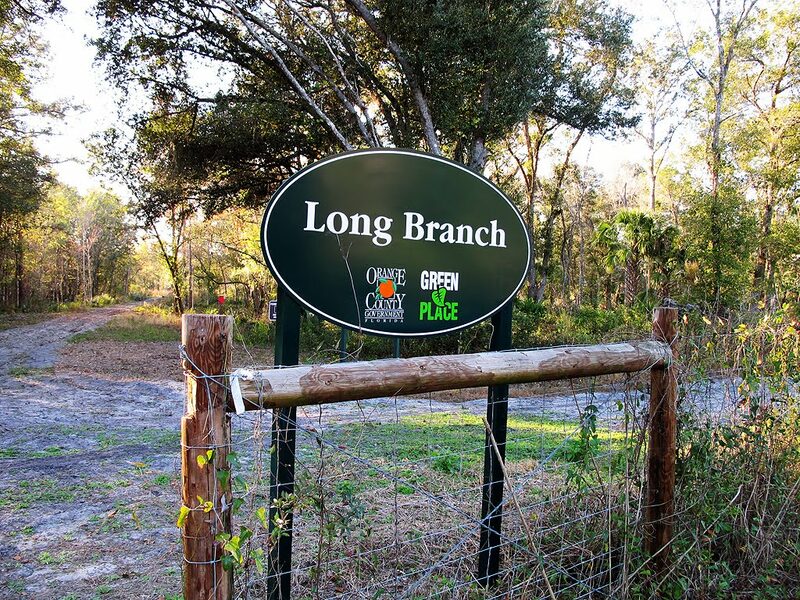 The name of the preserve is taken from the Long Branch, which is a tributary of the Econlockhatchee River and passes through the property. 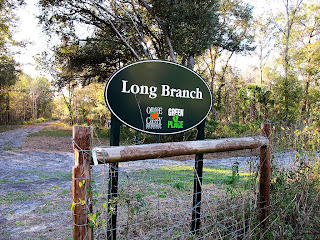 Long Branch also flows through the Pine Lily Preserve. Depending on the season, Long Branch could be completely dried up or found flowing nicely. Like much of old Florida land, this place also has hidden spoils hinting of its history. I managed to poke around a far portion of the preserve. First walking all the trails and then venturing out to explore for historical relics of old time Florida. Commonly in this type of area, you can find remnants of days gone by. However in Long Branch Preserve, it appears that the original structures have been destroyed for some reason. I did find some remnants of the homestead which once made up the area, wooden items and barbwire mainly. Looking at old satellite views, I did see some of the old structures. The preserve is bordered on the South by Hal Scott Preserve, on the East by CR13, on the West by the Econlockhatchee River and on the North by private property. 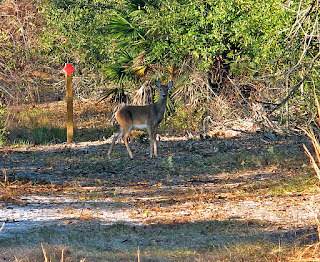 The times I visited the area, I saw several deer and even some turkeys. There always seemed to be a songbird, as well as Pileated Woodpecker flying around. In the wet areas, especially down near the river, you will find a variety of wildflowers and butterflies. 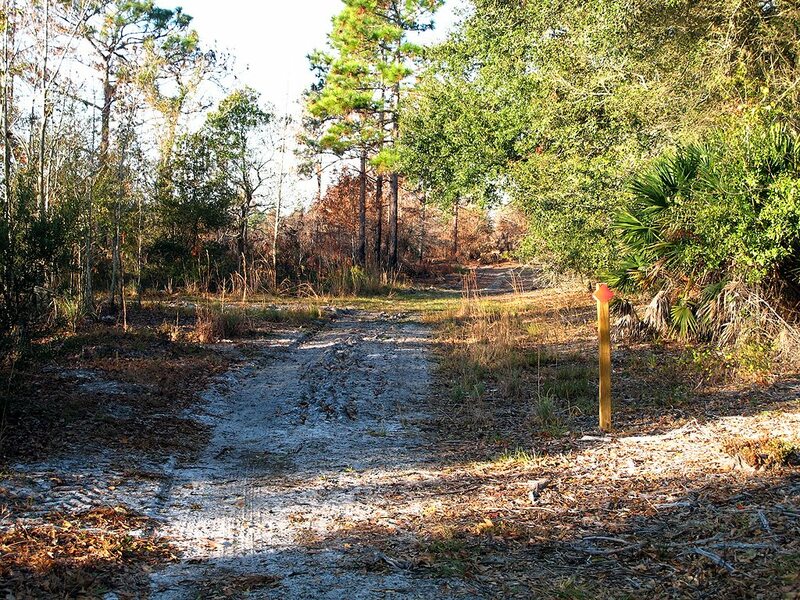 Beginning at the gate to the preserve [located on CR13], the county has created a well blazed trail that heads west. The county has elected to use red triangle tags on posts to blaze the trail. Conveniently they are located on wooden posts placed along the trail, making them pretty easy to follow. The trail is actually an old farm road in most cases, allowing you to walk abreast with a friend as there is no real narrow trail to follow. 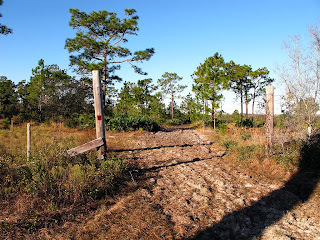 When I visited the preserve, a portion of the trail had been chewed up in order to create a fire break. Those sections of the trail were a little hard on the calve muscles. The first section of the trail takes you through some small oaks and other hardwoods and an area of scrub pines and palmettos. You will emerge onto old Parton Farms Road for a short distance. The trail then heads into a section of very large and beautiful oak trees. 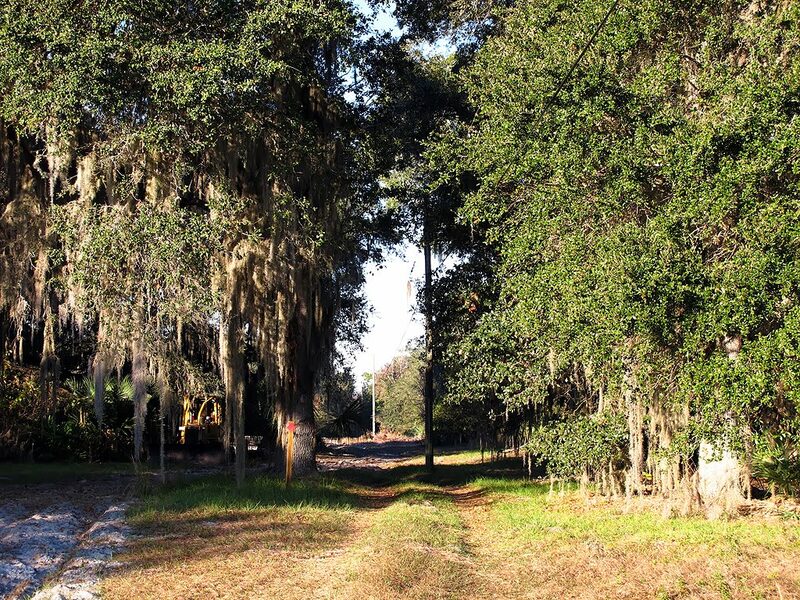 Upon exiting the large oaks, you will work your way up to a large set of powerlines which cut through the property. 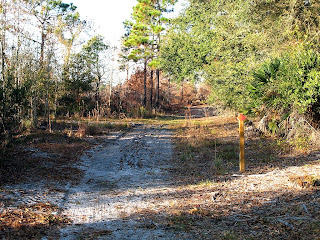 After the powerlines, you will enter the loop of the trail. I enjoyed this area the most; it is a very pretty section of the trail. The trail/road passes through a number of eco-systems, as well as passing some of what was the old homestead which once resided here. There is a woodpecker study area right near the trail. The State monitors large woodpeckers by setting aside areas in which they provide nesting holes in pine trees. You can always spot them because the study pine trees have a large white paint band around them. Around the loop you will come to three ponds next to the trail, I’m assuming these were all made by the farmers who worked this area. 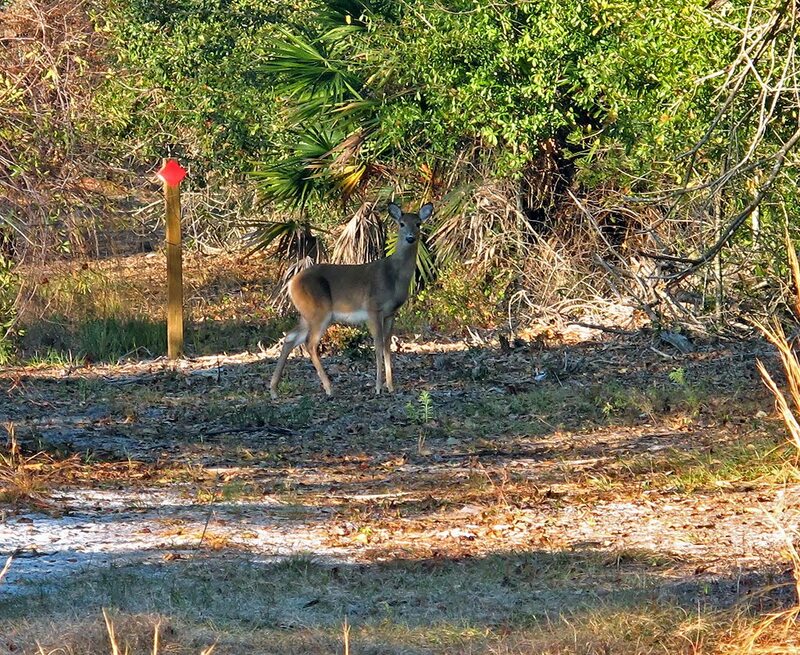 You will notice game trails around the ponds; these are watering holes for the local wildlife. I will also assume that there might be a gator or two around them at different times, so be careful. The trail comes close to the Econlockhatchee River, but you cannot see any part of it from the trail. If you wanted to go down near the river you will have to leave the trail, following one of the old farm roads that wind down to the river. Two things you will notice from the trail which will make you aware that this was a community once upon a time; one is the wooden electric poles, still strung with electric wires which provided power to the homestead. The other is barbwire, still around the area. Always be careful of rusty barbwire, if scratched by it you could get Tetanus (lock jaw) (I get a Tetanus shot to protect me from that every 10 years). 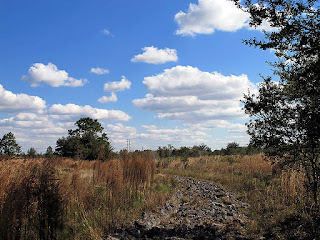 The trail, then loops back to the powerlines through what was an old pasture. You then head back to the main gate, using the same trail you came in on. The total distance is about 4 miles. 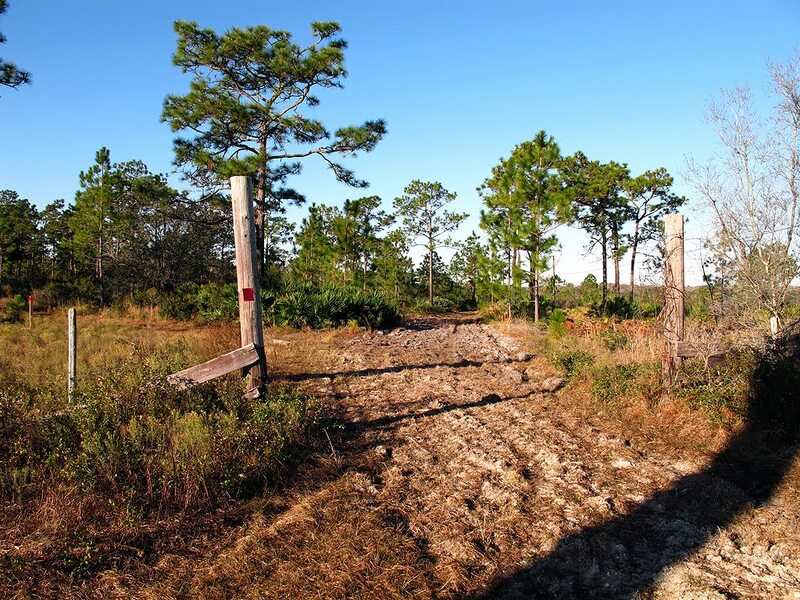 The Long Branch Preserve does have a lot of private property around it, so always be aware of your location and show courtesy to what belongs to others.. Once you get out by the major powerlines, you can head south into the Hal Scott Preserve. If you follow the road south which runs under the powerlines, you will come to the Hal Scott red trail. Because the three preserves (Hal Scott, Pine Lily and Long Branch) are connected at different points, you could hike a portion of all three in a single day. 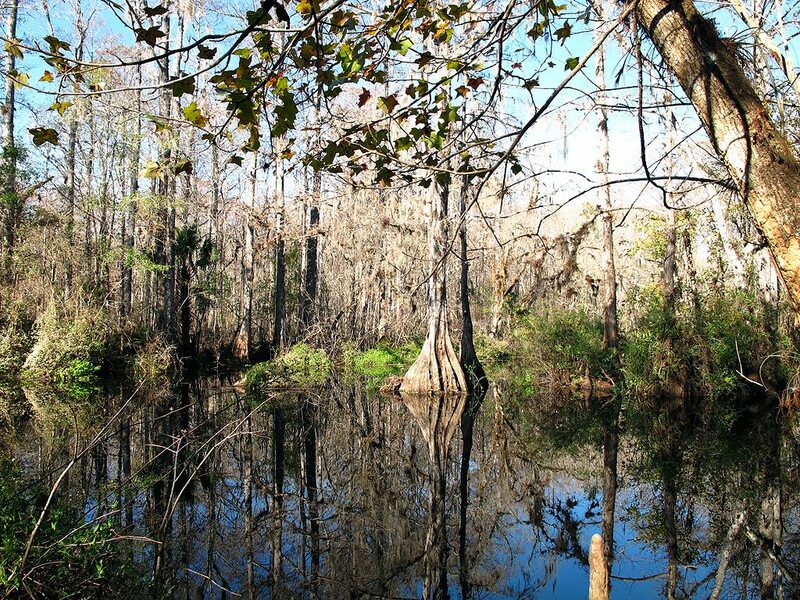 Another area you can venture into is the cypress swamp which runs along the Econlockhatchee River. Depending how wet it is, you can get right up to the river. When down by the river, always be aware of deep muck, as it can grab and hold you. I’m also told that there are some gators in that river, so just keep your eyes open. I love cypress swamps, so of course I spent a fair amount of time wandering around that section of the preserve. There are a few oak hammocks around the preserve, which contain some magnificent oak trees. Being that it was an old homestead, you might find something from the old homestead. Do not disturb or take any historical items from the preserve, it is against the law. If you’re into GEOCaching, there are a few of those to find. All in all, you can visit just about all the major sections of the preserve in a single day, as the total area is quite manageable. During a visit to the cypress swamp near the Econlockhatchee River in April 2012 I came across a few more very interesting historical items. I found an old animal pen which was so old that the trees where growing over the wire. 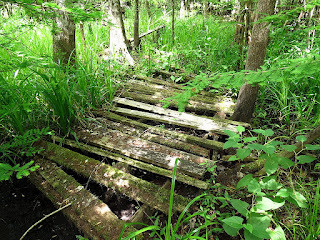 I also found footings and wooden structures which looked like part of a major walkway which lead from dry land down over the swampy area to the river. 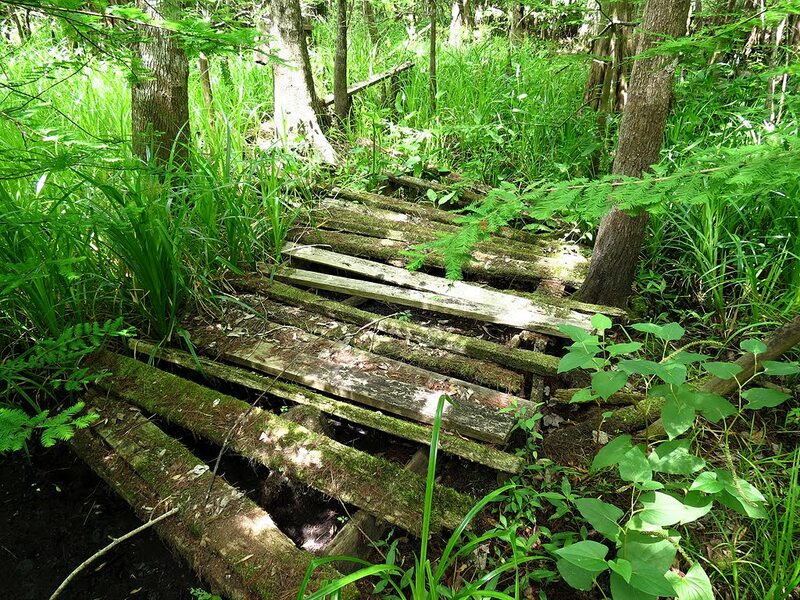 It seems the original landowners built this walkway to gain access to the river. There may even have been a dock on the river or a footbridge over the river once upon a time. If anyone knows about any of these items or more about the history of the area, please tell me about it! Great site! Thank you very much for all the detailed info. I would very much recommend your site to anyone in the area who wanted great ideas and tips for hikes in the central/space coast area. Looking foward to new entries, and as a suggestion we have some great areas further into Indian river county. Cheers! Thanks Tom for your excellent photos! They've been a big help in finding several local hikes within biking distance from my home. Just did Long Branch Preserve today for the first time, saw deer and turkey and even peafowl at the far end of the red loop (saw only one female, but there must have been several others, they were doing their signature triple-calls off past the tall grass). Can't wait to try more of the trails you've photographed - thanks again!